Organic-Lock™, the strongest performing Organic Glue on the market, is now offered through Kafka Granite! The patented formula, which is the result of more than 10 years of Agricultural and Geotechnical Science, can be combined with Kafka Granite’s 40+ colors of natural stone and recycled materials, creating one of the most advanced and aesthetically pleasing stabilized pathway material on the market. In a rainfall simulator study performed to compare erosion resistance between Organic-Lock™ and two leading competitors, after 120 minutes Organic-Lock experienced only 0.9% product loss while the competitors experienced 88.8% and 92.4% product loss. 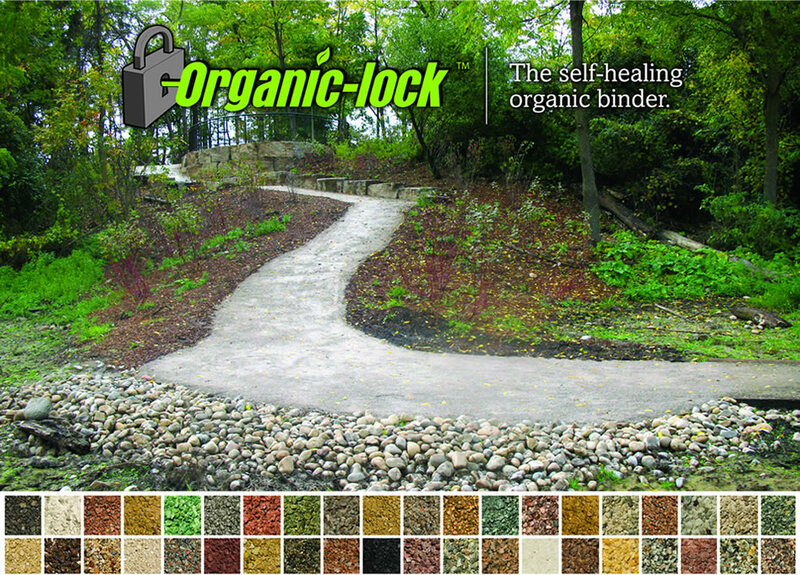 In addition to its permeability and unparalleled ability to resist erosion, Organic-Lock’s self-healing properties make repair and maintenance incredibly simple. Furthermore, with over 40 Kafka Granite colors to choose from, Organic-Lock™ is transformed into a unique and environmentally friendly alternative to hardscape. Kafka Granite’s Organic-Lock™ pathways produce not only a naturally beautiful aesthetic, but an incredibly functional one too! Kafka Granite is proud to offer a variety of stabilized pathway options in order to provide the most appropriate solution for your next pathway project! If you are interested in learning more about Organic-Lock™ or any of our pathway products, contact one of our Kafka Granite’s sales representatives today!